Designed with a Slower speed of set for a Longer open time. Hot press and R-F compatible. Titebond II Extend Wood Glue combines weatherproof performance (ANSI Type II water-resistance) with a slower speed of set. It is ideal for exterior applications that involve more complex assemblies. It also provides a translucent glue line, offers excellent sandability and is unaffected by finishes. 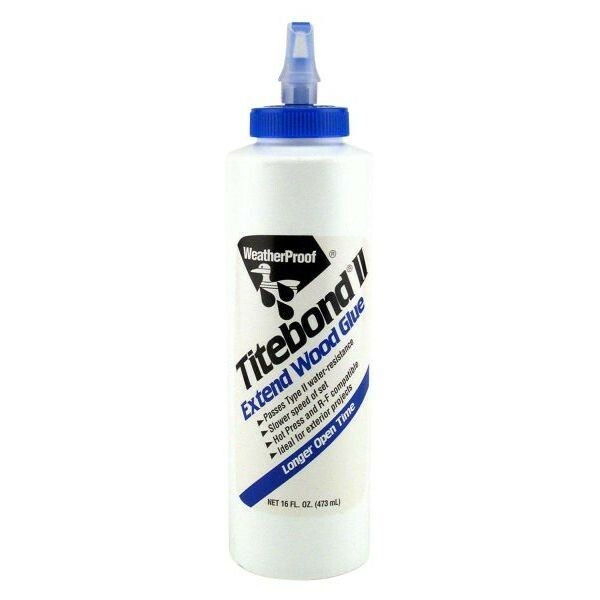 Titebond II Extend offers superior performance on all common wood species, particleboard, MDF, plywood and other porous materials. In addition, it is compatible for use with Hot Press and radio frequency (R-F) gluing systems. 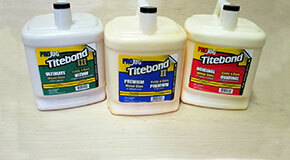 Titebond II Extend Wood Glue is not for continuous submersion or for use below the waterline. Not for structural or load bearing applications. Do not use when temperature, glue or materials are below 60°F. Freezing may not affect the function of the product but may cause it to thicken. If product appears to have settled, stir to ensure uniformity. Because of variances in the surface of treated lumber, it is a good idea to test for adhesion. For best results gluing exotic or oily woods, such as Ipe and Teak, please contact Titebond Technical Support Team at 1-800-347-4583. Note: Stir before use to ensure uniformity. Read MSDS before use. Keep from freezing. Keep out of reach of children.